Intelligencersubway week February 23, 2016 8:11 a.m.
A problem at Union Square cascaded into hours of underground hell, revealing just how fragile the subway really is. Passengers waiting for the 6 train at 96th Street on October 16, 2015. By virtually any standard, we’re in the midst of a delay crisis. During the dark ages of the subway — the late ’70s, before a capital program rescued it from crumbling entirely — the system had about 320,000 recorded delays a year. From March 2013 through March 2014, according to the New York State Comptroller’s most recent audit, that number was 498,889. On bad days, the delays add up to a point of no recovery. On good days, it’s just plain bad. On October 16, just before 7:05 a.m., a downtown 6 train — the 0620, named for its departure time from Parkchester station, ten miles away — pulled into Union Square. The jaws extended, closing the gap; the doors opened; some passengers got off and others got on. But when the doors closed, one set of jaws — “gap filler No. 6” — did not retract, which meant the train was stuck. The train’s operator called in to the Rail Control Center, the MTA’s mission control, located on a high floor of a skyscraper in midtown. Unlike much of the MTA’s century-old infrastructure, it’s modern looking, with a bit of a Star Trek vibe, ludicrously high ceilings, and lots of people on computer consoles staring at large screens. RCC dispatchers are essentially the air-traffic­ controllers of the subway system, and their challenge is often as complex. When faced with an incident, they must decide — in consultation with four levels of supervisors — whether to hold a train while the problem is resolved, allowing other trains to stack up behind it, or begin rerouting trains, which can prevent a backup but only by throwing thousands of commuters off their routes. And the dispatchers must choose in which way they’ll inconvenience commuters as quickly as possible. What is the most delayed line on an average weekday? “If we can’t get a train moving in five minutes, we are going to start impacting other lines,” says Barry Greenblatt, the MTA’s chief officer for service delivery. Dispatchers often face a series of bad trade-offs. For instance, the MTA’s train schedules are set to minimize crowding at platforms at crucial merger points, such as where the F shares track with the E, M, and G. Each delay, therefore, has ripples throughout the system. “Let’s say an F train has a problem at Lexington Avenue–63rd Street,” says Greenblatt. Assuming the problem is with the inbound F, coming to Manhattan from Queens, one option would be to reroute all F trains to the E line, where they can at least continue going downtown. But if it’s rush hour, that section of the E line includes M trains, and both the E and F lines are already running 15 trains an hour. The line can’t handle more than 30 trains per hour. “There’s too many trains,” says Greenblatt. “It just won’t fit. We’d probably hold trains back.” But if they don’t move enough trains through, there will be fewer trains at the end of the line to start the trips back the other way. “We’re not only moving the passengers on that train, but just like the airlines, we’re repositioning the equipment to make its next trip out,” says Tom Calandrella, the MTA’s senior director for advanced service initiatives. To make matters even more complicated, the RCC has to order service changes without being able to detect precisely where every train is at any given moment. Calandrella calls that “the shocking part” of the place. “For 67 percent of the railroad” — that is, every lettered train line except the L — “we don’t actually see train movement or control any signals and switches from the control center.” Instead, they do it the same way they’ve been doing it for decades: train crews communicating by radio with a dispatcher. If there’s a delay, the dispatcher phones it in on the “6 wire,” an open party line, and awaits instructions. A few minutes after the train operator at Union Square contacted the RCC, the dispatcher on duty called in a maintenance crew and diverted downtown local trains to the express track. While train 0620 sat idly in the station, trapped in place by the non-retracting gap filler, all the 6 trains behind it, from Union Square to Grand Central, were stuck at their stations with no place to go. Those north of Grand Central were able to reroute through the Union Square express track, sharing the line with the regular 4 and 5 trains, which meant the 6-train delays would soon ripple down all three East Side lines. On a good day, 40 downtown 6 trains pass through the Lexington line’s 125th Street station during the morning rush. On October 16, just 23 trains made it through between 7 and 9 a.m. For miles, all downtown trains were queuing to get through the same logjam at Union Square. When Reyes’s 6 train finally left, it crawled, sitting open at each station for minutes at a time. That’s when at least a few passengers on trains up and down the Lexington line started to lose it. The subway is New York City’s pulmonary system; the great class-leveling engine of urban life; the main reason, perhaps, that such an extraordinary concentration of innovation and power and culture happened here and not somewhere else. Thirty-five percent of the metropolitan area’s workforce commutes via subway, bus, and commuter rail; the national average is 5 percent. Nearly half a million children use MetroCards to get to school, and 65 percent of international tourists use mass transit, contributing $18 billion to the local economy annually, which is why delays aren’t just a matter of inconvenience; they pose a fundamental threat to the functioning of the city. This new era of delays has already taken a toll, starting with people late for work: Last year, commuters asked for delay-verification slips more than 100,000 times. It took 20 minutes for a work crew to arrive to look at the gap filler. It wasn’t immediately clear why the jaws were jammed. The sensors that control the gap filler could have failed, or the jaws were maybe just stuck, or one of the pistons that power the jaws could have conked out. By 7:52 a.m., workers finally were able to retract gap filler No. 6, and train 0620 went on its way, “discharged” without any passengers. Testing out the gap filler with trains loading and unloading was a nonstarter, so the RCC ordered 6 trains to resume on the local track but to skip Union Square, going from 23rd Street straight to Astor Place for the rest of rush hour. Workers would have to wait to fix the problem. A recent audit by the state comptroller’s office found that the system’s weekday on-time record in 2014 was 74 percent, meaning one out of every four trains New Yorkers took during the workweek that year was late. The MTA responded by saying it preferred to measure effectiveness by the amount of time people wait for a train. But that measurement, too, known as “wait assessment,” fell short of the agency’s stated goals. Our standards are now lower than those of San Francisco, Philadelphia, and Washington, D.C., none of which have self-imposed on-time performance goals below 85 percent. 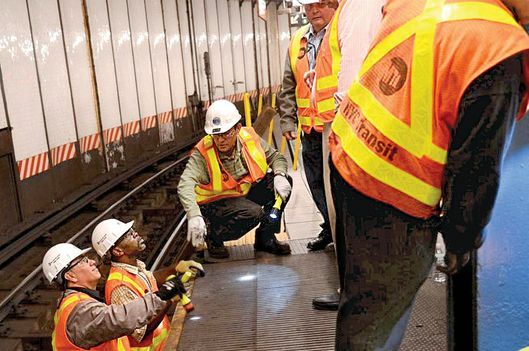 New York’s goal, reset last year by the MTA, is now 75 percent. Lateness, too, is defined pretty loosely by the MTA; any train that completes its route within five minutes of the schedule is considered on time. Which trains are delayed the most? The C and L lines, it may surprise you, are doing all right. The F, not so much. It recorded six times as many delays as the C and more than four times as many as the L. The citywide heavyweight champs of weekday delays, though, are the East Side 4, 5, and 6 trains — the Lexington line — each with more than 40,000 delayed trains from March 2013 through March 2014. The train with the lowest on-time percentage of all was the 4, just shy of a 50 percent on-time record. Justin Marks remembers the moment when he and hundreds of others on the platform heard an announcement that the next train would arrive in five minutes. “The whole platform kind of let out an exasperated groan at once,” he says. “It was sort of a communal misery.” Rush-hour 6 trains are supposed to come roughly every two minutes. Each minute during rush hour sends hundreds of new passengers to the platform, which means a five-minute delay could add as many as a thousand new people trying to fit on the next train when it does eventually arrive — often more than can safely exit before the next train comes in and dumps hundreds more onto the platform. That crowding slows down the unloading of passengers of the train that comes next, which — in a vicious cycle — creates even more delayed trains. What’s the most common reason for weekday delays? MTA executives are naturally defensive about the criticism. They argue that, unlike in the ’70s, the current problems are a result of their own success — the subways are more popular than ever and therefore more crowded. Six million people use the subways on a busy day now; since 2010 the system has added nearly half a million daily users. The 6 line alone is up by 200,000 daily riders compared to a few years ago. “It’s like the sponge is soaked and we’re adding more water,” says Calandrella. Rush-hour crowds can start at six; the evening rush extends past nine. Fifteen of the subway system’s 21 lines (not including the shuttles) have maxed out the number of trains that can ride safely on the routes, and ten of those 15 lines are at peak riding capacity, which means when something goes wrong, the dispatchers have no wiggle room. The MTA has blamed some 40 percent of delays on the system’s high ridership numbers, and the agency has few good options for tempering the crowds, including converting the train-car stock to “open gangway” cars, which annex the dead space between cars and convert it into usable space for passengers, increasing capacity by perhaps as much as 10 percent. Other cities have taken to rationing access to crowded stations or jamming passengers into cars Tokyo style. The cycle of crowds and delays has had other ancillary effects that themselves have contributed to even more delays, like an increase in sick passengers. If the trains had more room, the MTA contends, fewer people would have anxiety attacks or nausea or get overheated and faint. At 9:03 a.m., while the track workers at Union Square were still trying to get gap filler No. 6 moving again without having to shut down the line and replace parts, a downtown 5 train reported a sick passenger at 59th Street. As the train sat idle in the station, the 4 and 5 trains of the Lexington line stacked up behind it. It was the line’s second sick passenger that morning; another was reported on a northbound 5 at Fulton Street at 8:02 a.m., delaying a dozen trains for the next 15 minutes. Your commute may get a whole lot worse. Damaged during Hurricane Sandy, the Canarsie Tube, which carries the L train under the East River, is in desperate need of repairs. If the work is done on nights and weekends only, it could take seven years. If the MTA shuts the crossing entirely to speed up the project, it’ll take 18 months and inconvenience 225,000 weekday commuters. That afternoon, a passenger who ultimately refused help caused a ten-minute delay on a 5 train at 59th Street at 3:34 p.m., affecting eight separate trains. Then there was a nonresponsive passenger on a 6 train at 4:58 p.m. at 77th Street who eventually was taken to Lenox Hill Hospital (it sat for 17 minutes, affecting 25 different trains); a sick passenger who refused assistance on a downtown 6 at 59th Street at 5:21 p.m. (nine minutes, six late trains); and a drunk passenger who fell on the southbound 6 platform at Hunts Point Avenue at 9:11 p.m. (25 minutes of delays, 16 late or diverted trains). High ridership aggravates other sorts of problems. Overall, the subway is much, much safer than it was even a decade or two ago. From 1990 to 2014, there was an 87 percent drop in felonies, from 17,500 incidents per year to 2,200. During that same period, annual ridership climbed from 1 billion to 1.7 billion. In the past year, though, there’s been an uptick in subway crime: a 20 percent increase in robberies and 16 percent increase in felony assaults in 2015, compared to the same period in 2014. Certainly the crowds don’t help matters. Mid-morning on October 16, a male passenger was walking backward to let other customers off on an uptown 6 train and was pushed, he said, tripping in the space between the train car and the platform. EMS responded, and the customer refused assistance. It took 15 minutes for normal service to resume, holding up four 6 trains and five 4 trains. The MTA is currently embracing a new set of small strategies — a third way between muscular crowd-control tactics and expensive capital projects — to slowly change the behavior of New York subway riders to fit the new, crowded normal. 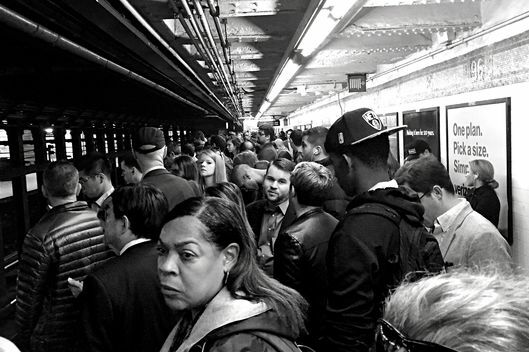 The MTA casts this as cultivating civility — a strategy that maximizes the system’s efficiency. “The public has a large role here, and I hate to say it,” says Wynton Habersham. Crowd control may be the MTA’s main focus because crowds seem controllable, at least by comparison with its other big problem: propping up the ancient, enormously complicated subway system. There are 865 miles of track, enough to connect New York to Chicago, and an amazingly complex intermingling of the tracks and stations once built and run by separate private train companies and now crudely jammed together, carrying 6 million people a day, sometimes on train cars that date back to when the Beatles played Shea Stadium. So it’s not all that surprising that track and signal problems, along with other unplanned events and scheduled maintenance, account for about 48 percent of all delays, more than what can be attributed to overcrowding. It was a track circuit that caused the 10:50 a.m. delay on a southbound 6 train. The train was passing Astor Place when it suddenly came to a stop. The emergency brake had activated. The RCC dispatcher held all trains behind it and instructed the train operator to go see what the problem was. Trains have gotten more foolproof and more stuffable. R32 Introduced: 1964 Found on: C, J/Z No. of cars: 222 The oldest still running. R160 Introduced: 2006 Found on: C/E, F, J/M/Z, L, N/Q No. of cars: 1,662 The first MTA subway car to have those electronic signs showing passengers the upcoming stops. R211 Expected: 2020 Found on: A/C, J/Z, F, S No. of cars: 1,025 CCTV, Wi-Fi charging stations, and video screens. “Open gangways” between cars will increase capacity by as much as 10%. A little credit, first: The track-and-signal system is by far the most essential holdover from the early years of the subway system, and, in its time, it was revolutionary. The problem is, that time was almost 150 years ago. When rapid transit was first envisioned, it was impossible to track the precise location of a train. Instead, in the 1870s, William Robinson devised an ingenious work-around that made it physically impossible for one train to collide with another. Every few hundred feet of the system would compose its own circuit. Whenever a train tripped a circuit, an operator could assume the train was occupying a specific section of track, until the train had moved completely to the next circuit of track, and so on down the line. Every time a circuit breaks, the signal goes red, and a foot-long metal rod flings upward from the track. This is the stop arm; any train coming past would hit it, flicking on the train’s emergency brake. It’s a foolproof method of preventing collisions, but it tends to overreact. “Any slight impediment, if you will, on the roadbed, on the track, the track circuit has to possibly see it as a train,” says Habersham. “It doesn’t know. We just know that energy is not getting to that electromechanical relay. We have to assume it’s a train. So the signal system has to react accordingly, and signals have to go red.” This is exactly what happened at Astor Place; a stop arm was in the “up” position, and no one knew exactly why. Sixteen minutes later, at 11:06 a.m., the 6 train at Astor Place was back in service. The cause of the glitch remains a mystery. Four trains were made late in that time — or later than they already were — and three others were canceled. This was a good outcome, compared to the norm: The MTA’s data shows that in 2014, each weekday incident based on signal problems caused an average of 17 separate delayed trains. As soon as rush hour ended, the maintenance workers at Union Square had tried to get gap filler No. 6 up and running for good. To do so without interruption, service on the downtown 6 line was completely suspended between 14th Street and Brooklyn Bridge. With the line shut down, the workers were finally able to assess the problem, which appeared to be a single loose bolt. They tried to bring the train back online, restoring service on the local 6 track at 11:02, but seven minutes later, the gap filler failed to retract again. That train and all the trains behind it were held in place. By midday, the cascading delays were no longer confined to the Lexington line. Trains were so backed up on the East Side that the RCC dispatchers made the decision to send some 5 trains up in the Bronx down the 2 line. They had no choice, really— those trains needed to get to Brooklyn somehow or the evening commute would be toast, too. But they knew the decision would mean more traffic on the West Side’s 2/3 express line — which, in turn, would mean more delays. By the end of the day, 30 downtown 2 trains and 29 downtown 3 trains would be made late by East Side trains that had been diverted because of the gap filler. Back on the Lexington line, delays on the downtown line had rippled onto uptown trains, stalling 59 uptown 6 trains, 15 uptown 5 trains, and 25 uptown 4 trains. But the Lexington-line passengers were luckier than most in at least one way: At least everyone waiting knew when the next train would arrive. The countdown clocks are the subway system’s great triumph, the one thing that customers love without question. But right now, only seven lines have them — the 1, 2, 3, 4, 5, 6, and L. The numbered lines are tracked by a program called Automatic Train Supervision, or ATS, which adds a digital overlay to the existing, century-old track-circuit setup so that trains can be monitored remotely. What is the most crowded platform during weekday morning rush hour? CBTC won’t be coming to the whole subway for decades. It’s not just about replacing the track-circuit system. It requires remodeling or replacing the entire fleet of subway cars. Even when it does come, it’s an open question whether CBTC really will keep up with the demands on the system. On the L line, Habersham says, the MTA thought it would need 18 trains per hour, so it equipped 22 trains. “By the time we went live with the system,” he says, “we needed at least 25 trains. The ridership just ballooned by like 500 percent.” The L’s end-to-end travel time has gone down just 3 percent with CBTC. Yet without it, the crowding, and the delays caused by that crowding, would have exploded. Money is naturally behind all the system’s shortcomings. Last year, after the MTA leadership declared a funding crisis, the city committed a record $2.5 billion to the agency’s capital plan, and the state committed $8.3 billion. Even with that new $29 billion budget, only 68 percent of stations will have countdown clocks by 2020. With the 6 line still shut down, the crew asked for the RCC to send a test train empty of passengers to make sure the gap filler would work, and at 2:30 p.m., all seemed well. But when the next train came a few minutes later, the gap filler once again failed to retract. 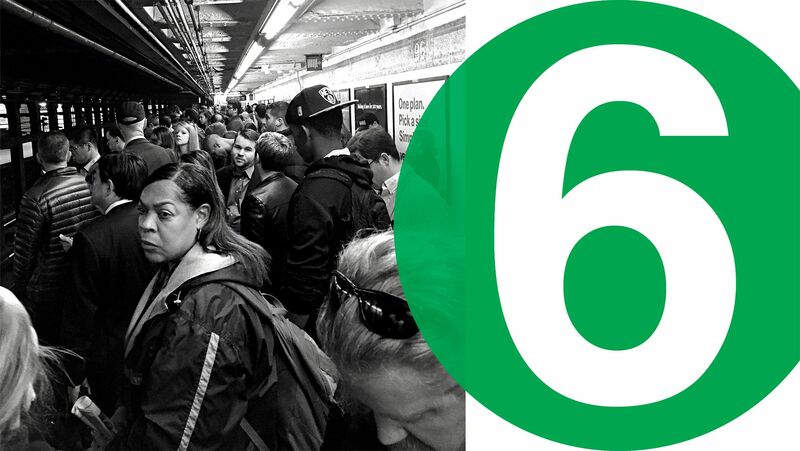 At 2:56 p.m., the RCC ordered southbound 6 trains to bypass 14th Street until further notice. Crew members would wait until after the evening rush to try again to fix the problem. At 7:35 p.m., the maintenance-of-way division issued an emergency general order. If they had to wait anyway, they decided, they might as well replace the piston, too, which would be sent from the MTA’s Tiffany shop in the Bronx, where the structural steel used throughout the system is fabricated. The problem wouldn’t be completely resolved until the next morning. Before it was fixed, that one loose bolt in the gap filler delayed or redirected 625 different trains — 132 on the 4 line, 119 on the 5 line, 306 on the 6 line, and the remaining 68 on West Side 2 and 3 trains. There’s another argument that the real problem behind the increase in delays isn’t the culture of subway ridership or even a budget shortfall but the culture of the MTA. When the agency lowered its on-time goals, was it being realistic or accepting defeat? I’m reminded of the recent comptroller’s report and its condemnation of the MTA’s dysfunction. “Transit officials,” the report concluded, “had no formal corrective action plans or programs to minimize the chronic underlying problems that caused delays.” Instead, the delay problem is being picked apart by more than a dozen task forces, studies, and initiatives. It’s like they say in track-safety school: There’s no such thing as a simple shortcut. Only quicksand. Additional reporting by Edward Hart and James D. Walsh.